Welcome to a new school year! Parents, this is the place to check on class assignments and announcements for the Library. This year, the Library has a new look - over the summer, we have transformed part of the Library into a Media Center/Maker Space. We still have the full library book collection, never fear. We are still in the process of arranging some special collections, such as the Maker Collection and the Classical Curriculum Collection, so please bear with us as we work. 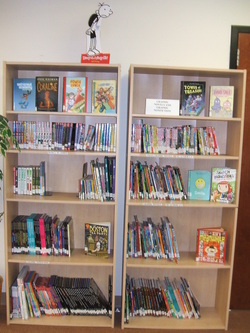 The Fall Book Fair is done, packed up, and will be picked up on Monday Sept. 24. Thanks to all who purchased books and fun items - we met our $5000 goal! Mrs. Kan thanks all the parents who volunteered to set up, help the younger students with their wish lists, help with Family Night, and to pack up - you all made Mrs. Kan's job easier! Also thanks to Dr. Parks, who stepped up and ran the cash register during Family Night! Library cards - important research tools. Parents, please take your children to get library cards from the public library. Even if you never check out books, the card gives you access to FREE databases with excellent information for research. Students who have their cards will be able to access those databases from home and from school. Students should have their library card numbers written down so they may access databases from the school's computers. THIS IS VERY IMPORTANT! EVERY STUDENT SHOULD HAVE A LIBRARY CARD FROM OUR PUBLIC LIBRARY!